The R-5 Rudder Zinc Anode is hand poured using special high grade 99.995% zinc ignots, which ensures a higher quality zinc anode. 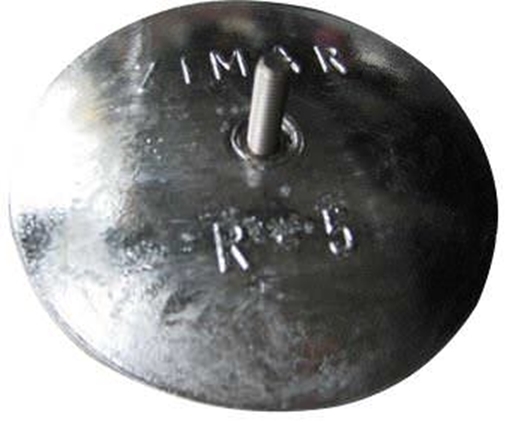 Save big on the best R-5 5-1/16" Rudder Zinc Anode available. All Zimar Zinc Anodes are made in the U.S.A, and meet all standards set forth by Mil-Spec A-18001K, Mil-Spec A-18001A, and Mil-Spec A-18001. Best rudder zincs at the lowest prices. I am very satisfied with the overall savings getting zincs from Deep Blue Yacht Supply. I am very happy and will recommend them to all my peers. I buy these every year from Deep Blue - great zincs!